In 2015, I ran my first virtual race. That virtual race was through an organization called Run the Edge. After that virtual race, I found out about online running communities, virtual challenges, virtual running partners – you name it; if you don’t want to get to know someone but want to have a committed running partner, he or she is out there for you! You just have to find that special person…. Anyway, as I write this post, I am training to run my body for 13.1 miles, or what is better known as a half-marathon. I have never run one before, and I’m doing it to cross it off my bucket list. You can see my general training plan here: January 2016 Run Goal Update. I’m getting all the wonderful health benefits that comes with a complete and total lifestyle change, and I hope to keep it up well into the years of when my growing children leave the house. Virtual races have become an important part of my “not getting bored” with racing plan. I have chosen a 12-week preparation plan, which includes running four times a week, for a minimum distance of 3 miles, and other mileage ranging from 5 miles, 6 miles to the eventual 11 miles. I’ve enjoyed the plan immensely and it appears to be working, but the chance to earn a medal for all these times I’m running for “training purposes” has been an extra bonus that has motivated me in a way I can’t explain – it’s just that much more fun. This past month, this was a popular topic in a Facebook running group I’m in, and I’m writing this post primarily for my future self, and anyone else that stumbles upon it looking up places and links for Virtual Races. Here are the sites I have verified (as of the date of this blog post) that have virtual races one can sign up for, pay the entry fee and get options sent to he or she, such as shirts, medals, or miscellaneous race bling. Run the Edge: This is the virtual site that started it all for me. In November of 2015, I paid for my first medal for the “Hug a Runner” challenge and some of the fee went toward a program called Girls on the Run. This year, I joined the 2016 miles in 2016 virtual race, as a husband and wife team with the love of my life. I’m looking forward to doing their “Selfie Challenge” in the summer, as I’m one of those runners that loves to takes selfies on my runs. Fit Fam: I signed up for the PI day 5K challenge. Some of the fees benefit STEM (Science, Technology, Engineering, Mathematics) education and I’m hoping to eat a slice of pie the same day I do this run. On purpose, of course. Make Yes Happen: Available Virtual Races include the Race to Oz, Escape the Shire-Journey through Middle Earth and Black Friday Half. Running on the Wall: They have a Virtual Race part of their website, but they also sell a significant amount of runner swag and bling, and great gifts for runners. 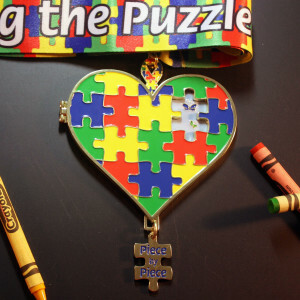 This is the medal for the Virtual Strides website “Piece by Piece” race, benefiting the Autism Speaks organization. Virtual Strides: Like the “Make Yes Happen” website above, this site gives money to charity with the fees collected. There is a “Piece by Piece” virtual run in early February with a chance to win a $50 gift card to the site, and the charity benefited is Autism Speaks. US Road Running: This site has a “Boston Strong” medal that I’m interested in getting for a 5K, 10K or a half. Gone for a Run: This is where I signed up for my “I Love 2 Run” virtual race in February. Hogwarts Running Club: If you love the Harry Potter Series, like REALLY, REALLY LOVE the series, this is the club for you. The virtual races and the medals are all associated with Harry Potter themes, and I may sign up for a race just to say I’ve done one. Will Run for Bling: And Charity…. This site currently has a couple races that are available, and has past events that I hope they do again this year, especially the Galaxy Run and the Run Now, Wine Later Race. Both of those are right up my alley! Here’s a ton more that I verified the links for, but didn’t even scratch the surface on checking out the medals/bling/charities. I guess that’ll be for a later date…. Flex It Pink – The link takes you to the virtual race page and it looks like a shop at first. Just look for the virtual run swag. Level Up Runs – Not a charity site, but they have really cool medals! POW! Virtual Running – A UK based company, you have to submit your results to them BEFORE receiving your medal. I got mine though for a couple races and they have great customer service. Virtual Running Club – There’s a form to fill out prior to receiving your medal, but you get it eventually. This group does donate a portion of the funds to charity! Virtual Nerd Runs – Some of the money helps Leukemia & Lymphoma Research and they have a Millenium Falcon Medal!!! The Virtual Runner – A UK based company, I plan on trying to order a medal to see how long it takes to get here. They have nerdy themed medals which is just my style! My next virtual race is for Valentine’s Day, called the “I Love 2 Run” race, and it’s only 2.14 miles. I plan on incorporating the distance into one of my scheduled runs for the week. You don’t have to run with other people to get medals. This was a great start for me. I didn’t feel the pressure of running with other people in a race that I wasn’t sure if I was even going to finish. With virtual races, I feel all the joy of finishing purpose-filled runs, with some of the fee going to various charities, and I have something to show for all the running time I’m investing in my life. I hope this post encourages you to get started on any sort of exercising. Even walking counts for many of these challenges. Just getting the time/mileage in is the important part. Thanks for stopping by and I’m glad it helped!